Statistical evidence and scientific proof might impress us, but when we read real life stories, we can feel inspired and moved. We can sense the genuine relief of a real person whose everyday life has improved. 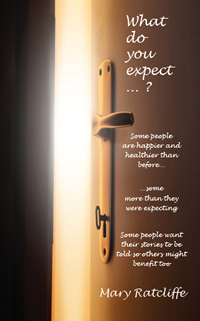 Accompanying the theoretical world of Mary's earlier book ‘What if it really is... ?’, with its ideas, theories, analogies and anecdotes about the subconscious mind, ‘What do you expect... ?’ follows the treatments and benefits enjoyed by four people who are keen for you to hear their stories. You might find a challenge here to change your expectations, and if so, will you take that challenge? Some reviews for "What do you expect...?" I can't thank you enough for your help in changing my life. If I hadn't picked up your card that day I would very possibly not be here now, my life was really spiralling out of control. I'm so glad to be living proof that there can be an alternative to years of medicine and therapy. This book provides a great insight in to real life examples of how LCH® can help, from serious habits to medical illnesses and psychological issues. It gives clear explanations with great analogies to how the subconscious is at the helm of some of our problems. It’s a very powerful read and a must for anyone interested in how our mind controls our health. If you are conscious, you should read this book! The joy that is gained from helping people to live their lives more comfortably and contentedly shines through clearly – and allows the reader a glimpse of that wonderful sense of purpose and satisfaction. If just one person decides to enrich their lives by having a course of treatment or becoming an LCH® therapist because of it, then this book will have done its job and the ripples of one life changed will spread out across unknown distances for the benefit of so many more. Read about Mary's previous book "What if it really is...?"